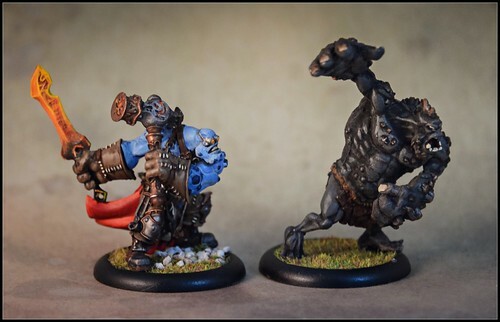 With the latest wave of Hordes releases from Privateer Press came the new Troll solo Horgle Ironstrike, and I couldn't resist grabbing him as the latest addition to the Troll warband. Horgle works well with a couple of warbeasts from the faction (Pyre and Slag Trolls), so I decided to paint up a Slag Troll to go with him. Went with a more stone and iron style scheme for the Slag Troll, and I was pretty happy with the results. Managed to achieve a suitably textured finish to him that sells the metallic elements that go with the blacksmith Horgle. It also looks like he might be effective on the battlefield, so will look forward to getting to throw him at the enemy next time out!